IT COULD BE Spain’s answer to the Loch Ness Monster, its long lost cousin or just a really big fish. Locals believe it’s either a mutant fish, a water dinosaur or some sort of water dragon. 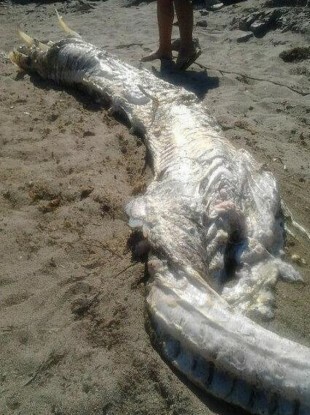 Whatever the creature is, it washed up on a beach in Villaricos, in south-east Spain last week. Ideal.es reports that the horned sea monster was four metres long and in an advanced state of decomposition. So much so, that it had to be buried to get rid of the stench. Any one have any idea what this creature could be? Let us know in the comments below. Email “WTF is this horned 'sea monster' that washed up on a beach in Spain?”. Feedback on “WTF is this horned 'sea monster' that washed up on a beach in Spain?”.